The Sausage Tree, Kygelia Africana, is so named after its fruit which looks like a short fat salame (singular form of salami). Perhaps it was the Italian connection that led me to buy one specimen about 15 years ago and plant it at Tremisana Lodge. This year is the first year it has borne any fruit – and the monkey troop at Tremisana is responsible for the lack of sausages. No sooner does the tree produce a flower, which is a beautiful dark red/maroon colour, than the monkeys promptly eat it. I am told that these flowers, as is the case with pumpkin flowers, are very palatable and may be fried once battered in a garlic dip. What a waste of pumpkin and sausage ! 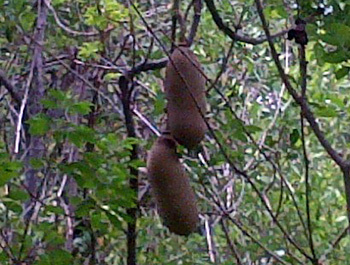 Anyway I managed to take the photo below of the sausage tree fruit – they were located in a very inaccessible place which is probably why the monkeys never managed to eat the flowers. The Sausage tree provides all year shade as it is evergreen. It provides food for baboons, elephants and bush pigs. I am told that the bark may be used as a tea which helps in rheumatism. We have planted another 10 Sausage Trees in the gardens at Tremisana so that Delina , in her old age, will not suffer with rheumatism and continue her magic in the kitchen. Volunteer program Acornhoek, Kruger National Park and Balule Game Reserve. On the fourth of October, I picked up two Canadian ladies Tammy and Virginia at Hazyview to spend nine (9) days, doing safari and volunteer program at Acornhoek orphanage home and Funjwa Primary school. They come from Canada to help local children. On Monday we went to school to meet with teachers and students. They showed us around the school and explained the challenges that they are facing at the school. On the following day they were ready to teach children to read and write English. It was very interesting to see local children happy and enjoying the company of the international guests. It was not only about teaching them how write and speak English – they did a lots for poor children. We went shopping for almost six hours, trying to get uniforms for the poorer children. I did help as well looking for right sizes. They bought uniforms for five children – Shoes Socks, T-shirts, Jerseys and Pants and girls Skirts. They bought a TV for the orphanage home. Everything they bought was designated to the right people. 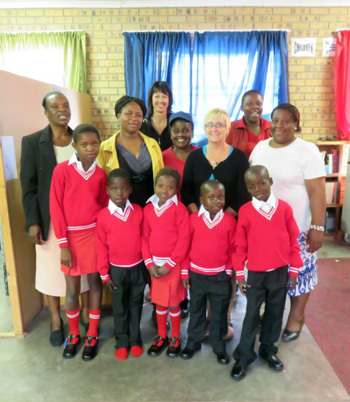 The children wore the uniforms in front of Virginia and Tammy to make sure that the clothes went to the right children. We left the lodge early in the morning. Our first sighting was a leopard eating a warthog very close to the road. It moved away from the road because of too many cars around and took the carcass with it. The leopard was looking forward to cross the road and it walked along the road for almost half an hour. Everyone kept on following the leopard trying to see it taking the carcass up the tree. We saw some elephants drinking water along the Timbavati river. Later a group of zebras joined them. It was awesome to see this animals together drinking and standing very close to each other. The day was a great success and, as happens in the dry times, we managed the Big Five in one day ! Kruger provided another great month of sightings, the lions being a reasonably common sight, either lying in the long grass sleeping or feasting on the remains of a buffalo. The smaller things like the impala have all been waiting for the first rains, with majority of the females heavily pregnant. The elephants are feeling the summer heat and following a tight schedule of a morning mud or dust path, followed by a late afternoon swim. It was one of these afternoon sessions that my guests and I really got to enjoy : the elephants had decided to go swimming to cool down, on a particularly hot day. All we could see were trunks sticking out of the water like snorkels, other than the splashes of younger bulls, as they pushed each other about; testing their strength. Once the matriarch decided it was enough they all left the water and followed her off to find some tasty trees for an afternoon snack. It wasn’t long after seeing these big elephants swimming, that we came across a big bull rhino. What made this particular sighting so memorable was mainly due to what he was doing. We sat and watched as he moved along slowly, marking his territory with urine sprays as well as stomping his feet in piles of his dung, to spread his scent across his territory. It was a great experience to see the big male hard at work, and a good chance to give my guests a firsthand example of why rhinos make dung piles. The lack of rain has resulted in a lot of activity around the water holes – often just by sitting and waiting we have been lucky enough to spot several different species, all heading down to the water for a drink. It was while watching hippos, that I had one of my better lioness sightings. We had stopped to watch a pod of hippos lying around in the water when we all heard a loud snorting sound coming from the opposite side of us. As we turned around to investigate, several waterbuck dashed past us, followed by a very hungry looking lioness. The lioness stopped as it reached the road and slowly started walking alongside us – we could hear her panting and saw the look of hunger in her eyes. We followed her along the road until she dashed off into the bush, heading towards some very alert impalas; she had lost the element of surprise and decided to rather wait in the shade for a better opportunity, a very exciting scene to be part of, and so close to the action. The leopard is always a tricky one to see which makes every leopard sighting special. It was one of those days where everything seemed to fall into place, just after viewing a pride of lions, we found out about a leopard, which had been sleeping up in the tree for most of the morning, so we headed off to find out if it was still there. After driving along looking into every tree that looked like a good spot for a leopard to be, we just couldn’t find anything and decided to turn around, it was a good move. 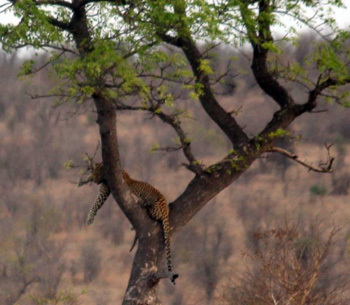 On our way back we noticed something dangling from a tree, it was a leopard leg followed by the rest of the body. We sat watching as the leopard just lay in the shade, enjoying its Jackalberry tree. We were able to get some great pics as it stood up and moved a little way up the tree, to find better shade. The sunset drives in Balule have provided some moments of great excitement, with a mixture from the tiny lesser bush babies to big elephants, the best being a lioness sighting. We had finished dinner under the stars at the beautiful Marula Boma, and began heading back towards the lodge, stopping for the occasional flap neck chameleon and lively bushbabies, leaping from tree to tree; It was however a big lioness who stole the show. It was now about half way to the lodge when I spotted eye reflection in the thick bush, so we stopped and investigated, it wasn’t long before we had a lioness walking alongside us, she was on a mission to find some food, and moved with intent, my guests where so pleased to see a lioness, so close; it really capped off a great evening. This month has been a rather amazing month with the rains arriving slowly but surely, the bush is changing with lots of the trees getting leaves and even more of our migratory birds coming back including bee-eaters and cuckoos. Regardless of the rains and overcast weather the drives still go on and they are getting better and better with a variety of everything, you get the true feeling of the bush now. This day was an extremely good day as it had started out overcast and everyone including myself thought it was going to be one of those cold days but fortunately as we got to the gate the clouds vanished and the skies were clear making for a brilliant start to the day. After all the paper work was completed we headed off on the adventure of the day and we didn’t have to wait long before the first sighting of a beautiful herd of elephants was grazing not far from the road allowing for some beautiful photos of the babies along with the matriarch leading them to the best trees for feeding. While watching the elephants we had some visitors come through including some impala, giraffes and wildebeest all of which were in the area and we could see them clearly. We decided to leave the elephants and carry on the see what we could find, what seemed like forever we went without seeing much and hopes were dwindling low, but the bush was doesn’t done with us and had a few surprises to show us as we arrived at a watering hole and one of my guests said he saw something way in the distance so we stopped to check it out and he was right, there way in the distance was a female rhino with her baby running in front of her, we were all excited myself included as this was the first time I had seen this rhino and it gave such hope to see the little one looking so healthy, unfortunately it was a short sighting as something had scared her and the little one and they ran off into thick bushes but we enjoyed the sighting none the less. After the excitement of the rhino, we carried on to a picnic spot to check for any updates in the area, along the way getting things like zebra and giraffe and impala beautiful sightings of all. When we got to the picnic spot I was happy to see one of the other Kruger companies out and they immediately gave me an update for lions not far down the road, so the bathroom was cut short and excitement grew even more as we raced over to the area hoping to catch them before they moved off and out of sight for us. Along the way there was a huge herd of elephants up in the hills near the watering hole but I assured my guests that they would be down by the water on our way back. We eventually arrived at the road were the lions were but to our sadness they weren’t at the 2km mark so we all felt rather upset but pushed on down the road hoping they had maybe moved, and that’s exactly what they had done as we found them 1km down the road with one no more than 5m away from the car sitting up and giving us the show of yawning and all that amazing things allowing for some amazing photos opportunities. By the time we were done with them time had gotten away from us and I needed to get to lunch so we headed to the lunch area passing by the dam near the elephants again and true as anything they were swimming in the heat of the day right in the middle of the dam and we got to watch the mothers watch over their youngster while they swam. Along the way to lunch we didn’t get that much as everyone was tired from the long drive and wanted to get to lunch but we did get buffalo, just a few bulls very old but very nice. Again I assured my guests they would be there after lunch. So we stopped for lunch and I spoke to the other guys and no one seemed to have any other cat sightings and it seemed I was the only person other than the person who gave me the update that had found lions in the morning. After lunch we headed back along the tar road and those buffalo were now closer to the road and allowed for some amazing close ups of the old bulls with the huge horns and a few of them crossed the road while we there. We pushed on and didn’t get anything new along the way other than hippos that weren’t doing anything exciting. A short way down the road we came across rhino down in a river bed just sleeping and this one was nice and close again allowing for some good photos of him but all of which was bum shots and every now and then he gave us the horn but then turned back to sleep. We headed off again and sadly didn’t get anything exciting till the exit but as soon as we got there we got given an update of lions down the road, now although we had already seen lions we wanted more and sped off in the direction of them and found a mating pair not far down the road, unfortunately having found many vehicles on the sightings we didn’t get a good visual but stuck it out and we were the last on the sighting and had a good visual of the male standing up and watching his surrounding before we had to leave. As you can see this month was a lot of fun with plenty of sightings everywhere and even better was that there was a lot of lion sightings. I saw two young leopards of about 1 and half years old crossing the road near the Phelwane dry river bed. One of the leopards stopped in the middle of the road 20m in front of the car, the leopards then started walking together and they ran into the bush. 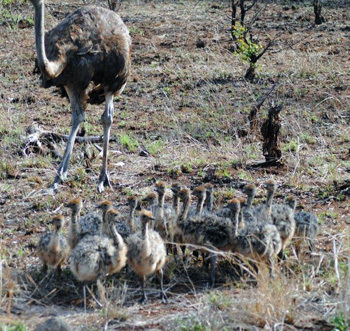 A pair of female ostriches were walking with 17 chicks of about 2 weeks old at Ngirivani. Later on a male ostrich appeared from a distance and saw them and rushed to them with its wings open attacking the female ostriches and then turned to the chicks and hit one of them on the ground until it died, he then went for another chick killing it on the ground. The female ostriches were standing there with no way to help but watch, the male ostrich then walked away dominantly leaving the ostriches with their chicks as they changed direction away from him. Not sure what to make of this – I know lions that take over a pride kill the young so that the lionesses come into oestrus and he can then mate with them, but this behaviour by the ostrich probably indicates that he was not the father of the chicks. On a Balule sunset game drive, three lionesses and one male were located at Shigomba Dam sleeping near the dam wall. The lions were 30m away from the vehicle when I arrived and one of the lions woke up and licked its paw. Later on the lion stood up and walked to a green patch of grass, she coughed and regurgitated a bit of food then ate again. This is commonly done by starving lions. 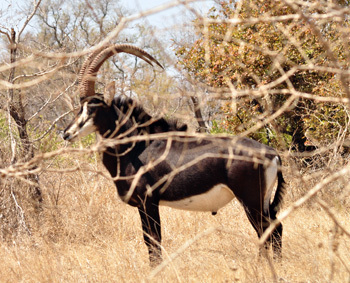 A rare sable antelope bull was seen grazing on the S146 cross towards Talamati bush camp. The sable antelope bull was by the dry river bed, open clear view from the road. A bull elephant of about 16 years old was located dead with his front feet stuck in a forked bend. The elephant was on the Nwaswintsontso river road S125. The elephant seemed to have struggled the whole night as there were branches everywhere and there were two male lions panting after feasting on the elephant. White backed and lapped faced vultures were soaring around the meal waiting to attack. On a Balule bush walk at the Olifants River, two hippo bulls were fighting a young bull against one old bull. The bulls were bellowing and fighting in the river until the old bull escaped out of the water bleeding with scars. The young bull then chased the old bull away from the water for about 100m until the young bull stopped and returned to his home full of blood. Viewing a herd of waterbucks drinking water across the open road along Timbavati river bed. The moment they were drinking a male leopard approached the animals from a nearby bush and a water buck calf spots the leopard and alerts the herd to cross the river. Making the leopard walk back in the bush with no meal and giving up. Three male lions kill a buffalo close to the S36, 30m from the road. The lions guard their meal as vultures were trying to grab a piece of the meal. On the S100 a male cheetah chased a grey duiker across the road and it was a battle of speed and skill for 50m. The duiker then got the advantage of jumping through a bush and left the cheetah with no meal for that moment. The cheetah then walked back on the road losing the hunt. The word ‘Duiker’ in Afrikaans means ‘Diver’ so it lived up to its name ! A morning walk at Marc’s camp we find a breeding herd of buffalos with some lying on the ground. They spotted us and started walking towards us slowly as their seeing something they don’t know. The buffalo’s then began lifting their heads up and down to challenge us and getting ready to attack, we then started moving backwards slowly and they stopped and carried on with their grazing. You don’t always have to drive around the reserve or into Kruger to encounter our incredible animals; you can literally have some truly unique experiences just in the camp alone. This month so far I have encountered Leopard, Rhino, Buffalo, Hyena and even the very rare pangolin in and around or not too far from the living areas. Firstly the leopard on my roof at 1am was certainly the most memorable for the month. I woke up to this loud banging sound on my tin roof, of course in my half sleep state I thought it was initially baboons, so after the banging persisted for 20 mins I finally walked out of my room to scare what I though was a baboon off my roof. I went outside clapping my hands and yelling “hey hey, keep it down buddy” to my amazement and shock, a leopard popped his head over the side of the roof and showed me his teeth and gave me a warning growl. With not less than 2 metres between the two of us, and both looking at each other I quickly retreated to the safety of my room, locking the door behind me. The banging sound I heard was him slapping his tail on the tin roof. I inspected the area in the morning and could see just how he managed to get onto my roof via a tree and then I could see his spoor and traced him down to the riverbed where he then crossed to the other side. What an adventurous night !!!!! Next was the sighting of Pangolin. I was on my way back into the reserve when out of the corner of my eye I see this dark, odd & oval shaped object moving into the grass. I was thinking first possibly a rock dassie, but those guys are not nocturnal, then it hit me……. Oh My Gosh am I looking at a Pangolin????? This magical creature that only few people get to see in their lifetime is crawling past me. Wow! My 2 guests and I watch the little guy in amazement, we kept our distance because I knew the moment he felt threatened he would curl up into a small ball to protect himself exposing his overlapping scales, and seeing him move around with his razor sharp tail was truly a memorable sight. We stayed with him for roughly 10 mins whilst he was searching for dinner. From this brief interaction I observed a great deal of their behaviour. I could see how they only walk on their powerful hind legs using its tail for balance, as their forelegs are claws used for digging. This sighting is certainly something that will stick in my mind for the rest of my life ! Wow ! My first Rhino sighting at Marc’s Camp couldn’t have come sooner. Each morning on the bushwalk I can see evidence that the rhinos are in the area, seeing their tracks and dung also areas where they have been sleeping, however I have not managed to stumble across them as yet. This one particular evening I was driving the guests back from a day in the Kruger, not more than 200m from the gate we came around the corner and happened to come across 4 White Rhinos. 1 male, 2 females and one calf. They were absolutely magnificent standing not less than 15 metres from the car. We watched them for a few minutes before they retreated deeper into the bush and out of our lights. It was the perfect night to see them as we missed out seeing Rhino in the Kruger that day so it was quite a delight for these rhinos to welcome us home for the evening. Marcs Camp is full of wildlife, on a daily basis the extremely chilled Nyalas will greet you good morning along with the giraffe and zebras grazing and browsing not far from the rooms, then at night time you often will encounter some buffalo on your way home or you can hear them in the river bed echoed by the sound of the Hyena close by. Here at Marcs Camp you get a truly unique bush experience. I always thought January/February is the special month for babies but October has proven itself to make me think twice. Amongst various trips to the Kruger I have seen a variety of different species with young offspring. My sightings that are really worth mentioning are that of Lion, Wild Dog, Ostrich, Giraffe & Elephant each of which have had everyone on the vehicles thinking how cute and adorable they are, and also not to mention the changes in behaviour of the mothers when that protective instincts come into play. At Nsemani Dam we were lucky enough to find 4 lionesses with their cub crèche. 2 generations of cubs we could distinctively see. The 3 lionesses were teaching the older cubs approximately 18 months old how to hunt, whilst the other lioness was looking after the very young cubs approximately 4-5 months old. It was so special to see the younger cubs as they were still little fluff balls. Lionesses usually reintroduce their cubs into the pride after 3 months when they are big enough to move around and for our guests to see just how lionesses strategically rear their young was a very educational experience for them. The bonding you could see was so adorable as the mothers were licking their young clean and the small cubs playing with each other. 18 months old is such an important time in a cub’s development because at age 2 the males will start to get pushed out and they will be on their own to fend for themselves. Lion mortality rates are quite high so let’s hope these little guys have learnt their valuable life lessons so they can make it into sexually mature adults. It was my first sighting of Wild Dog pups. We had a tip off from a gentleman driving past who had mentioned he saw a strong pack earlier on in the day. He said it was the cutest thing he had ever seen, as he drove off the pups where chasing his wheels. So we headed in that direction hoping to find the wild dog, and to our success we found them. Standing over a termite mound we found a female with just one pup. The rest of the pack was likely to be on the other side or not far away so we were more than happy to get a glimpse of just these two. Wow this little pup was spectacular, judging from the behaviour the little pup had wandered off from the group and this female was bringing it back. Cheeky playful little thing. Quite regularly we get sightings of young giraffe and elephants but not so much the ostrich. Twice we were lucky to get sightings of ostrich chicks. Again these little chicks are just fluff balls with 2 legs and are very cute. Just by looking at these chicks you can see they are very venerable and susceptible to many different predators including; cheetah, leopard, jackal, hyenas, mongoose and even some birds of prey. Fewer than 10% of nests survive the 9-week incubation and of the surviving chicks only 15% of those survive to 1 year of age. Lets hope in a few weeks time we can be lucky enough to see some have survived the wild. Kruger is truly a unique park that is constantly changing every day. The rains have finally started to arrive so we can already see the bush changing into a beautiful green colour. By this time next month the bush will be completely different and sightings will become harder due to the thick vegetation. Lets hope the cats will remain nice and close to the roads and the leopards will continue to choose trees which are in nice view of the vehicles. It has been another good month in the bush!! The weather is getting warm, we have had some rain, the trees are getting green and summer is on its way!! The sightings continue to be amazing and I have met some really cool guests!! There has been lots of wildlife around the lodge this month Elephant, Buffalo, Giraffe, monkeys and more! The bird life has been very good as a lot of the migrants are returning! I have had a lot of good lion sightings, the best being three lionesses fighting over an impala! There is a black backed jackal den near the Marula Boma that has 5 cute pups and I have had beautiful sightings of them! Also by the Marula Boma we have been seeing hyena and genet that sometimes come by for a visit. The warm weather has also brought the reptiles out and I have been seeing a lot of chameleons, tortoise and snakes! The bush walks are still awesome, have been seeing loads of hippos and crocodiles recently! We got much needed rain in an epic thunderstorm with wind, pouring rain, hail, thunder and lighting, and the power went out! Lots of the monkeys that hang around the lodge have had their babies!! The bush is full of life, guests are awesome and it has been another fantastic month, and life at Viva is good!! MARC’S CAMP has had a lot of animals around the camp this month. A pack of Wild Dogs has also been around and there have been times when our Nyala herds have been scattered. 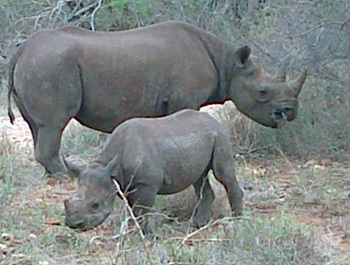 There have also been regular sightings of White Rhino and Buffalo. Leopard sightings have improved and Vanessa wins this month’s sighting of the month award – a leopard on her roof ! We have filled the Breakfast Dam with water from the river and have cleared away most of the reeds. A number of snakes have been seen this month but thankfully they all move away promptly at the sight of humans. I took this photo of a boomslang of over 1m in length. It disappeared down a hole moments later. Maintenance is going on at a rapid pace – we have rethatched units 10 and 11. We shall be rethatching the toilets and showers of units 2, 3 and 5 – these are the only treehouses that do not have en suite facilities. 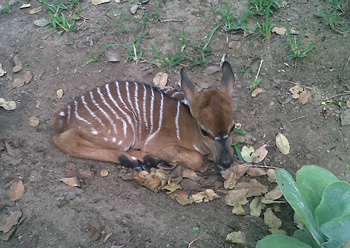 Ronald sent the pic of an 8 hour old nyala that was born right outside the main lodge entrance by the swimming pool. The guests were, as he put it, “ over the full moon ”. The nyala have given birth around the main lodge over the years as they probably feel secure insofar as the hyenas and leopards at Marc’s Camp generally keep away from areas where there is a lot of human traffic. TREMISANA LODGE has had very little rain this month – the veld is very dry. Animal sightings have not been great – we have had occasional visits from buffalo and elephants but the lions have kept away. We still get daily visits from the warthogs and impalas and there have been irregular visits from kudu, zebra , giraffe and wildebeest. 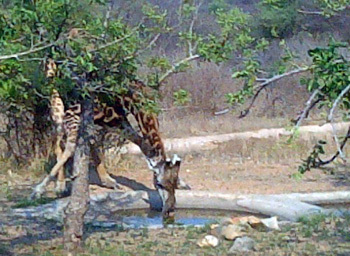 A lone male giraffe has been visiting the waterhole in front of the Lapa for his late afternoon drink and this has sometimes coincided with the arrival of guests from Johannesburg – almost as if we have planted him there. There are so many moments that simply take your breath away while you spend your time at Tremisana Lodge – our home away from home. The fact that that merely taking a walk outside the gate can encounter an elephant or a giraffe still intrigues us. The month of October has been a fairly busy month. We have had quite a number of remarkable animal sightings throughout the month – both at the lodge as well as the Marula Boma. One afternoon some elephants paid us a visit. They came just before the afternoon drive and managed to delay the drive by almost twenty minutes. I believe no encounter with elephants surpasses seeing them very close – they were 3 metres away!!!!. One of the elephants came very close to the fence wire close to chalet 9 and started feeding on the fern that was close to the water feature. He put on quite a show – only leaving after he had finished eating almost the whole plant. The guests were very excited. We welcomed to our family two students from the International Hotel School, Abongile and Ntando. At Tremisana Lodge we strive to assist schools that offer tourism and hospitality subjects by giving students high quality field experience. We give the students a chance to put into practice what they are taught in school. These two young men have been very helpful and have become part of the team helping with the office and hosting guests. We are really looking forward to the start of the rains. This will mean new life for our flora and fauna. We continue to make improvements to our lodge. A splash of new paint here and there. New plants in our garden as well as new linens for our lodge. We anticipate a slowdown in bookings as a result of the Ebola virus. Overseas tourists sometimes are confused about the real size of Africa and do not realise that Sierra Leone is closer to Europe than South Africa ! Please God, a cure for this virus will be in place in the near future. Our bookings for October were very good and we are confident that our year-on-year figures for 2014 will show a reasonable improvement on the 2013 figures. We have just returned from a fabulous 5 day safari in the Kruger/Greater Kruger National Park. The trip was organised by Viva Safaris (a wonderful, enthusiastic, knowledgeable team of guides/hosts) and included a one night stay night in Tremisana Lodge and four nights in Marc’s Treehouse Lodge. Both provided friendly, comfortable and value for money accommodation in stunning natural surroundings.The team at Marc’s Treehouse camp was particularly accommodating and welcoming and the home cooked food (including veggie options) was a real plus. The tree houses are made of wood and discretely positioned to fit in with the natural surroundings and to make the most of vantage points for animal viewing. Our 2 rooms were wooden cabins raised up on stilts giving us a great view of a watering hole. They were comfortable and cosy and hit the happy medium between being rustic yet well-equipped (fluffy duvets, mosquito nets and hot water). The reserve is teeming with wildlife. Monkeys in the trees, whooping hyenas at dusk, nyala drinking at the watering hole in the early morning. It was a thrilling and beautiful adventure holiday and our teens enjoyed it as much as we did. If you are looking for an uber-luxe, posh, sanitized safari experience, this is probably not the place for you. But if you are looking for exceedingly warm, friendly service, knowledgeable guides, clean but a bit rustic accommodations, delicious home cooked communal meals, then Marc’s Treehouse is a fantastic place. I had the experience of a lifetime staying here – the happiness and friendliness of the staff made guests so welcome that groups of strangers rapidly became lifelong friends. Sitting around the fire after supper we would share stories of the days’ adventures, inevitably laughing until all our sides split. The property is absolutely beautiful – my treehouse overlooked a small river and I would wake up to the sounds of animals coming for early morning drinks, and i would encounter many antelope on walking to breakfast. The range of travelers staying here was wonderfully diverse in age and nationality, and everyone brought with them a great sense of adventure and openness. 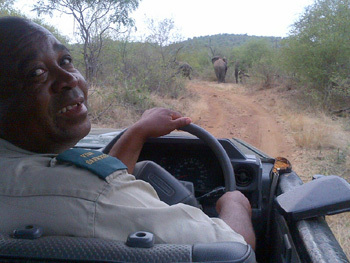 The game drives were very well organized, and as I mentioned the guides were exceptional. Extremely informative, they taught us so much about not just the animals, but plants, and the interconnected workings of the entire ecosystem. And while they made it clear that the goal was not just to check off the “Big 5” from your bucket list, but to experience this breathtakingly amazing part of the Earth, we did see the “Big 5”, the “Small 5”, and the “Ugly 5”!!! Given the affordability of Marc’s Treehouse Lodge, it surpassed my expectations in every way and I highly recommend it! As a female solo traveler I was very happy with the choice I made. Yes of course, there are ample number of safari lodges around and prices to go with what you choose. Viva safari was excellent value for money. Apart for being super lucky and seeing all the big 5, and much more the drivers/rangers on game drives were friendly and professional. The lodge was clean, comfortable and my room cozy and nice. The night drive was great and the finish touch – dinner under the stars was beautiful! It was an excellent value! Thank you Viva Safari! Would defenitely recommend to all my friends and family. I only spent one night here during my 5 day safari, and it was absolutely amazing! I saw warthogs and elephants and a lot of monkeys there, drinking and having fun in the water. the rooms/huts are quite big, they have A/C and clean bathroom. The beds were a little soft for me, I prefer harder mattress. The breakfast was tasty and plenty. I did not have dinner at the lodge, we had a BBQ in the bush. Unfortunately there was a misunderstanding: we were told we should order drinks before our sunset game drive, but I did not know it was drink for the BBQ. But there was tea/coffee available, so it was ok. There was WiFi provided for free at the reception area, where you could buy drinks. All the game drives and walks were organized very well. All the staff at the lodge and from Viva Safaris were very friendly and passionate about their job. There were 9 of us to go to a whole day game drive in Kruger one day. The open vehicles had seating capacity of 9 passengers + 2 seat at front. Viva Safaris sent 2 of their cars for us 9, so we could travel in more comfort. Very much appreciated. I was lucky to be with Viva Safaris’ best guide, Adam for the first two days of my stay. He was really passionate about his work, he proved to be very knowledgeable about wildlife and a very friendly, fun guy. I was happy with the other guides as well, but Adam was really exceptional. I’d also like to mention Luke, who spotted a leopard for us. Just wanted you to know that we had an awesome trip to the Kruger with Viva Safaris! The lodges were small, friendly, quiet and in beautiful surroundings. Just the right level of comfort mixed with a sense of the rustic! The team at Marc’s Treehouse Camp was particularly wonderful and their home cooked food a delight. The Viva Safari crew was superb…a lovely bunch of enthusiastic, friendly, accommodating and knowledgeable guides. And October was a superb time to visit…not too hot and no mosquitoes! I was blown away by the sighting of wild dog in the Kruger and mesmerised by the red velvet mite on our bush walk in Balule! It was a wonderful family adventure!